Photo by Brett Dunlap Mayor Tom Joyce was joined Sunday by a number of descendants of people buried in Riverview Cemetery on Juliana Street for the dedication of a new fence surrounding the historical cemetery. Photo by Brett Dunlap Judith Smith, of the Julia-Ann Square Historical Community Association, presided over the dedication Sunday of a new fence that surrounds Riverview Cemetery on Juliana Street. Photo by Brett Dunlap As part of the dedication of the new fence for Riverview Cemetery, a number of local re-enactors portrayed famous local residents who are buried in the cemetery. Kelleyn McClain portrayed Lily Irene Jackson, who is buried in the plot where the famed statue of the weeping woman is located. Photo by Brett Dunlap Gov. 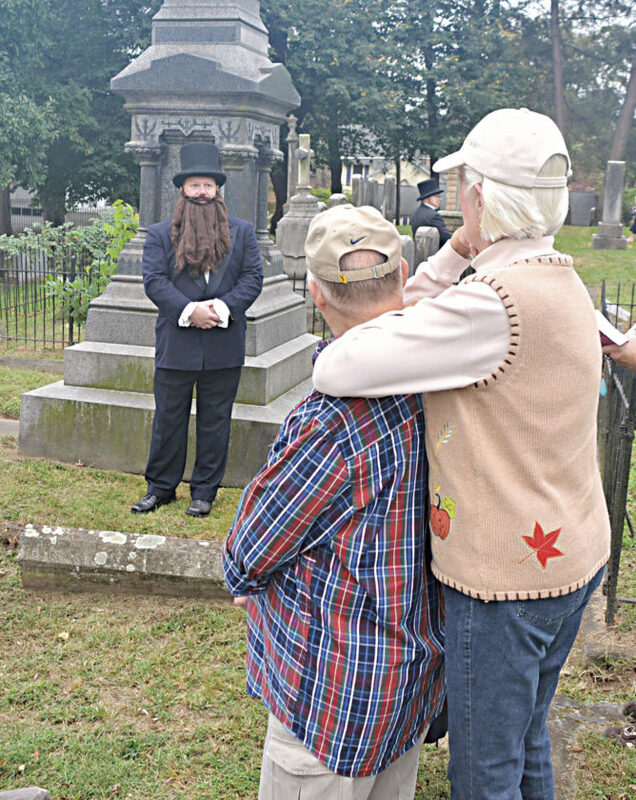 Jacob Beeson Jackson, the state’s sixth governor, was portrayed by Andy Rasmussen during a living history presentations Sunday at Riverview Cemetery on Juliana Street as part of a dedication ceremony for the new fence surrounding the historical cemetery. Photo by Brett Dunlap Julie Deklavon portrayed Clara Diss DeBarr, wife of artist Joseph H. Diss DeBarr who designed the great seal of the state of West Virginia. 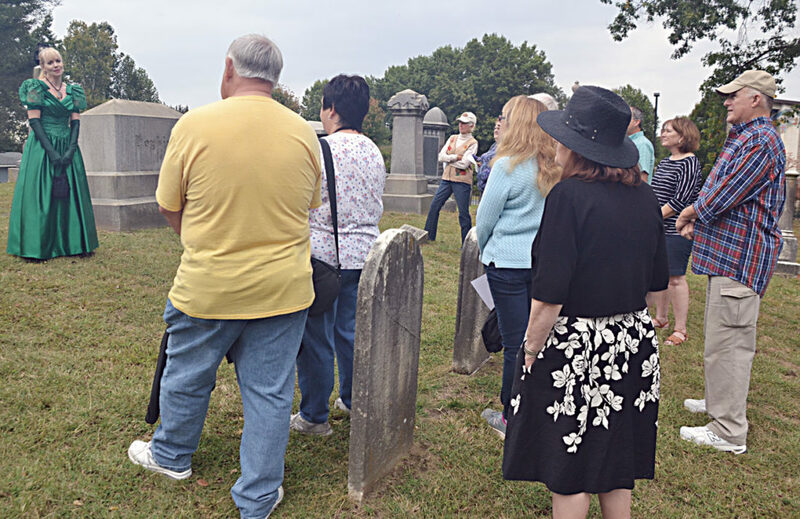 People toured the historical Riverview Cemetery on Juliana Street on Sunday as part of a dedication ceremony for a new fence surrounding the park. Photo by Brett Dunlap Robert Enoch portrayed Henry Logan, a local philanthropist who was the benefactor of the Henry Logan Children’s Home, while Kyla McGlaughlin portrayed Bella Smith, a slave purchased by the Robert McCandlish family who freed her, helped raise their children and who is buried at the family plot in Riverview Cemetery. 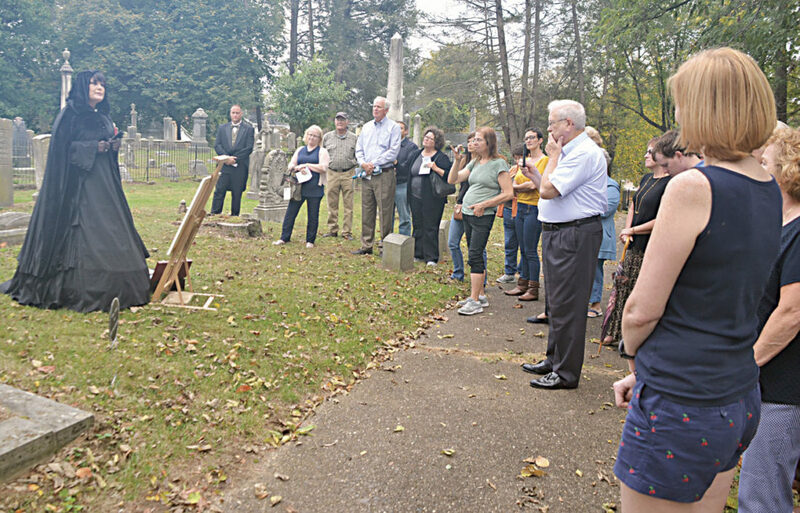 They were part of a living history presentation Sunday at the historical cemetery on Juliana Street to commemorate the new fence surrounding the cemetery. 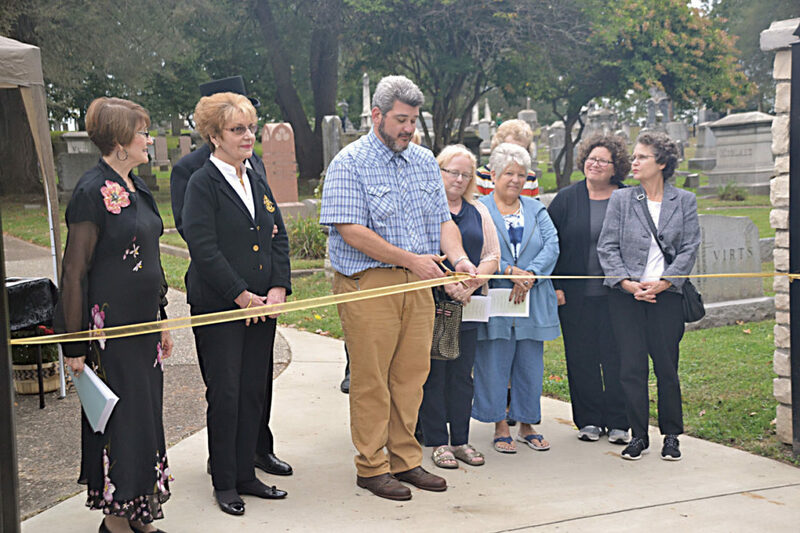 PARKERSBURG — Many area residents attended the dedication Sunday of the new fence at the historic Riverview Cemetery on Juliana Street. 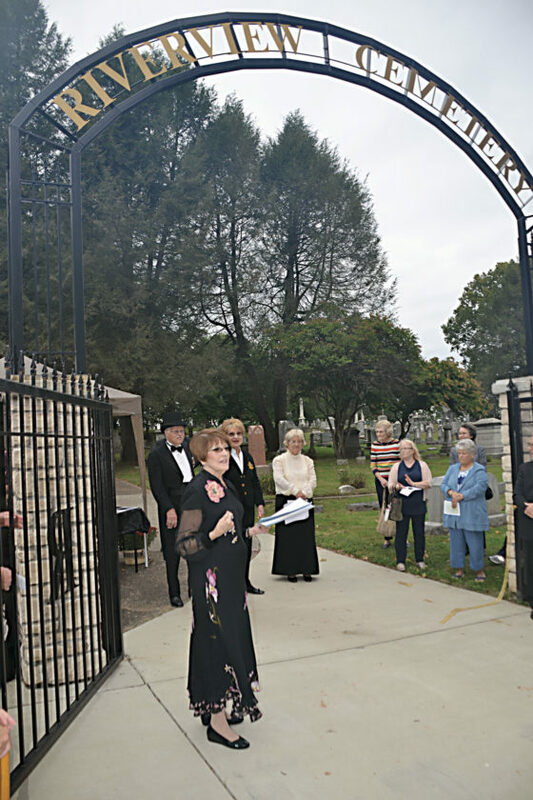 Around 75 people attended the dedication which included a ribbon cutting done by Parkersburg Mayor Tom Joyce and a living history event with re-enactors positioned throughout the cemetery to portray important Parkersburg residents interred at Riverview. The cemetery is located at the end of Juliana Street and is within the Julia-Ann Square Historical District. It was listed on the National Registry of Historic Places in 1977. Through donations and grants, the Julia-Ann Square Historic District was able to raise around $140,000 to have approximately 1,380 feet of fencing placed around the cemetery to replace old and rusting chainlink fencing and to restore the historical look of the cemetery. “We are here to commemorate all of the improvements to this historic cemetery and honor those who are interred here,” said Judith Smith of the Julia-Ann Square Historical Community Association. 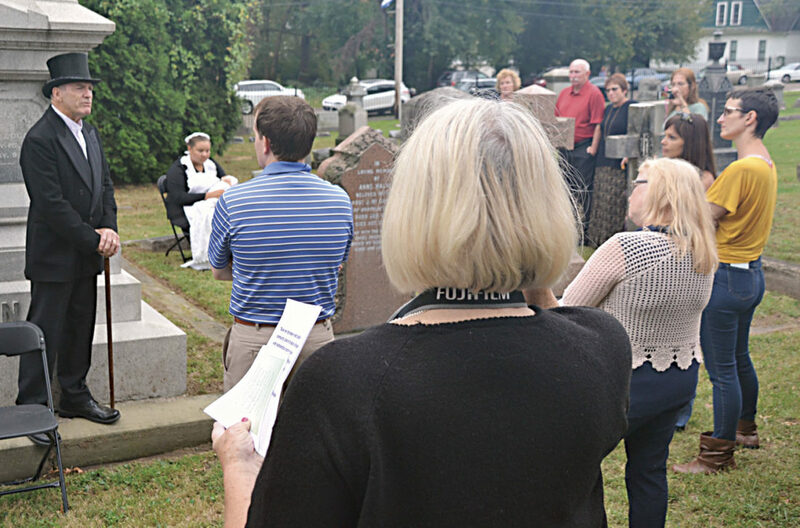 “Nearly four years ago, a committee of Julia Ann Square residents, members of other historic groups and descendants of those interred here began an initiative to make Riverview a showcase in Parkersburg. The cemetery was originally surrounded by a wrought iron fence which was believed to have been taken down in the 1930s-40s and replaced with a chainlink fence. Organizers of the project wanted to install a new wrought iron fence that resembled the original one. The new fence includes a stone masonry gateway with an arch sign that was not part of the original design, but was something of the original period that would be seen at other cemeteries at the time. Originally called the Cook Cemetery, the Riverview Cemetery was established in 1790 on the land settled by the Cook family, many of whom are buried there. Among those is James Cook, who was mayor of Parkersburg, a legislator in the Virginia Assembly, a sheriff, a railroad president and president of Northwestern Bank of Virginia. The cemetery is also the final resting place for people instrumental in the history of Parkersburg and the formation of the state of West Virginia. Those include William Erskine Stevenson, third governor of West Virginia, and Sen. Peter Godwin Van Winkle, one of the men who helped form the state of West Virginia and one of West Virginia’s first U.S. Senators. To do what they have done in less than four years, Smith said, “divine intervention” played a part. Most of the installation work had been done over the last few months, starting in the spring. If people do know about it, many think it belongs to First Presbyterian Church, not a part of Julia Ann Square, she said. “To those people who do know and care, all that money was able to come in,” Smith said. The group applied for and received a number of grants, including grants from the Oakland Foundation, the Parkersburg Area Community Foundation, the McDonough Foundation, the Henry Logan Foundation, the West Virginia Community Participation Grant Program and more. Businesses such as United Bank and Mike’s Tree Service also contributed to the project through donations and discounted services. Donations were also given by a number of individuals from around the community. The group raised money for the fence through fundraisers, like an Edwardian Evening at the Chancellor House, mailers sent to people who sent them back with donations, other living history re-enactments and more. The Julia-Ann Square Historical Community District was able to contribute around $30,000 to the project. “We had terrific responses,” Smith said. Resi Carpenter, of Parkersburg, had read about the event in the newspaper and wanted to check it out. Carpenter marveled at the work that had been accomplished and felt it enhances a site of local historic significance. Donna Briggs, of Parkersburg, said the “grandness” of the cemetery is what brought her out. She marveled at the re-enactors and the lessons they were giving those who attended. “This is a treasure chest right here,” Briggs said. “History can never be erased. History is history. It won’t go away. It is still here. In teaching these lessons, a new generation can learn about the history of the area. “You have to preserve it for the future,” Briggs said. “So many of the younger generations are losing that. Smith said there were still projects at the cemetery that need done, such as straightening up tombstones and other work. “We have a lot to do,” she said. “We felt if we did the fence first that would grab a lot of people’s attention.